LOUISVILLE, Ky. – One of the best business decisions that Greg Reece ever made was switching suppliers in his Kentucky Proud kettle corn business. Reece, owner of Mr. G’s Kettle Corn in Louisville, can tell the difference after making the switch last year to Kentucky-grown kernels supplied by Preferred Popcorn, another Kentucky Proud business. So Reece called Brian Churchill at Preferred Popcorn and started buying popcorn from him that was grown in Hopkins County. Reece said the kernels are bigger, which makes thicker pieces of popcorn. Reece proudly displays Kentucky Proud banners where he sets up his two concessions trailers, which he believes increases his sales. From March to mid-December 2014, Mr. G’s popped more than 9,000 pounds of Kentucky-grown corn. Reece said many of his customers ask him where they can buy his corn outside of his two trailers, which set up at several Louisville-area farmers’ markets from March to October as well as other special events, such as the Kentucky State Fair. Currently, the only retail store carrying Mr. G’s Kettle Corn is Lucky’s Market, 200 N. Hurstbourne Parkway in Louisville. His two commercial-size 160-quart kettles can barely produce Lucky’s Market’s standing order of 72 bags a week, which doubled briefly to 144 during the holidays. Mr. G’s was featured in December on Lucky’s sales fliers as a local businessman promoting Kentucky farmers. Reece dreams of opening a store alongside the distilleries in Louisville’s Whiskey Row, capitalizing on the Bourbon Trail tourism. He wants to have a storefront where passers-by can look through the glass and see his kettle corn popping in huge kettles even larger than his current 160-quart models. Exhaust fans would pump the aroma of fresh kettle corn onto the street to draw in hungry distillery visitors. “All the distilleries have glass walls so people can see how bourbon is made,” Reece said. “My vision is a glass wall behind the counter so they can watch us making kettle corn. If they see it being made, they know it’s fresh. 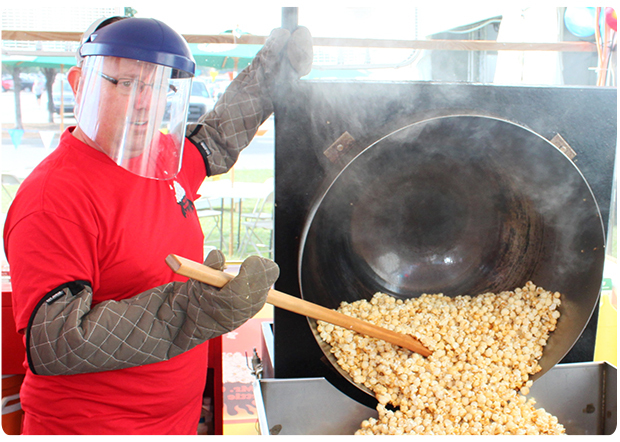 Reece never dreamed of being in the kettle corn business after attending Sullivan University’s renowned culinary arts program in 2011. He wanted to open his own restaurant. But banks were reluctant to loan the large sum of money needed to start a restaurant to an inexperienced chef. Reece, 47, retired in September 2014 after working 22 years as a truck driver. His interest in kettle corn was kindled when he attended a NASCAR race in Bristol, Tenn.
After doing a little online research and experimenting with recipes in his kitchen with a 16-quart kettle, Reece invested in a 160-quart commercial-size kettle and sold his first batch at a farmers’ market in 2011. “All I planned on doing was popping one day a week and making a little spending money,” he said. “But one thing led to another. I was asked, ‘Can you do it here? Can you do it there?’ I never said no. If you don’t live in the Louisville area, you can purchase Mr. G’s Kettle Corn online on its website, http://mrgskettlecorn.com/. Reece recently shipped orders to California, Colorado, and Michigan. He also sent eight 14-ounce bags to U.S. troops in Afghanistan. Reece currently has eight part-time employees to enable him to set up at two places at the same time. He is working on opening a permanent location in a Food and Drug Administration-approved warehouse facility, which would enable him to hire two or three full-time workers. Reece is planning to travel to Chicago and Cincinnati in the near future to look at industrial-size kitchen equipment. Reece said being in business for himself has given him a new appreciation for Kentucky Proud.